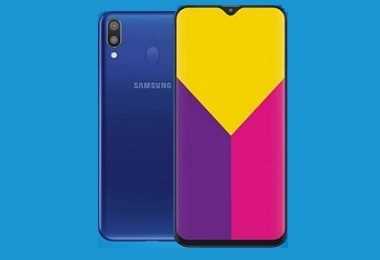 Latest price of Samsung Galaxy M20 64 GB in India was fetched online from Flipkart, Amazon, Snapdeal, Shopclues and Tata Cliq. 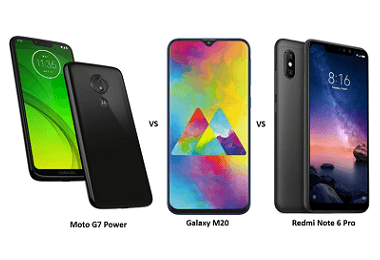 "Moto G7 Power vs Samsung Galaxy M20 vs Xiaomi Redmi Note 6 Pro: Price, Features and Specs Compared"
"Samsung Galaxy M20 vs ASUS Zenfone Max Pro M2 vs Xiaomi Redmi Note 7: Has Samsung Finally Got it Right?" It was high-time that Samsung made some considerable changes to the design of its budget range of Galaxy smartphones. 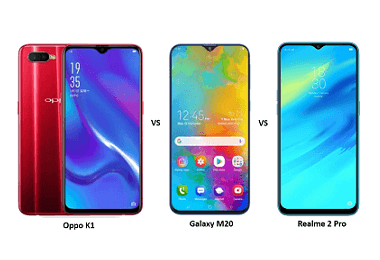 To keep up with the competition, Samsung first launched Galaxy M10 in January 2019 with an Infinity V Display in the budget segment. 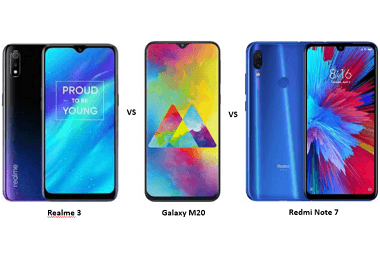 The release of M10 was followed with Galaxy M20 around a month later with some considerable upgrades in the specs to justify the slightly higher price tag. Powered by the new Exynos 7904 octa-core processor, Galaxy M20 is available in 3GB and 4GB RAM variants for effortless multitasking. Just like Galaxy M10, Galaxy M20 also features an Infinity V Display but has a slightly larger 6.3” display with a screen ratio of more than 90% for an immersive viewing experience. With features such as 3x Fast Charge, In-Display Flash, Dolby ATMOS, Face Unlock and Fingerprint Sensor, Galaxy M20 is one of the most impressive budget devices by the South Korean smartphone giant. Samsung Galaxy M20 features an Ultra-Wide Dual Rear Camera, allowing users to take amazing group photos. The primary rear camera is 13MP with an f/1.9 aperture to help one take great pictures irrespective of the lighting conditions. The 5MP second rear camera has an ultra-wide 120-degree angle of view to help users cram much more than what a normal lens would do. The camera on the front is an 8MP with a 2.0 aperture. It also has In-Display flash, a feature which is not commonly found in the Samsung Galaxy M20 price range. Talking about the storage, it is available in 32GB and 64GB variants to ensure that you have adequate space for all of your favourite pictures, videos, movies, apps, and more. You can also use a microSD card of up to 256GB to expand the storage further. While Galaxy M10 features a 3,400mAh battery, M20 has a massive 5,000mAh battery with 3X Fast Charge. Once fully charged, you can use the phone to watch your favourite videos for up to 28 hours. Moreover, with just 10 minutes of fast charge, M20 lets you listen to your favourite music for up to 11 hours and watch videos for up to 3 hours. As mentioned above, Galaxy M20 features a 6.3” Infinity V Display. It has an almost bezel-less FHD+ screen with an aspect ratio of 19.5:9. The display resolution of the phone is 2340x1080p with a pixel density of 409ppi for a lifelike viewing experience. Samsung Galaxy M20 is a dual-SIM phone and features nano-SIM card slots. It features a 3.5mm jack for connecting earphones and supports Dolby ATMOS sound with active noise cancellation. 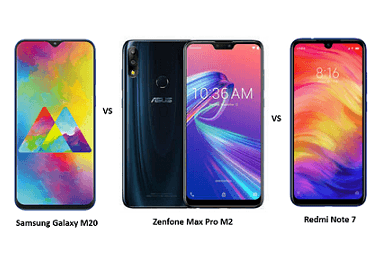 Other connectivity options include Wi-Fi 802.11 b/g/n, Wi-Fi hotspot, Wi-Fi Direct, Bluetooth 5.0, and USB 2.0 Type C. The phone also features GPS, FM Radio, and comes with all the basic sensors like accelerometer, proximity, compass, and gyro. The phone runs on Samsung’s Experience 9.5 UI which is based on Android 8.1 Oreo OS. Samsung has also promised that Galaxy M20 will receive Android 9 Pie update by August 2019. The new UI which was first rolled out in August last year comes with Bixby 2.0 and features such as individual recommendations, natural conversation, Uber hail response, and more.